First, I want to thank those who have taken the time to comment, and those who have subscribed. Although small in number, as I expected, it’s definitely motivating to know that others are watching. Second, I hope nobody is having trouble leaving comments or subscribing. In the beginning, I could manually moderate comments because spammers were few. But, even as esoteric as this blog is, the hated spammers have still found it, and I was forced to automate spam blocking. I am using Akismet, and it seems to be working well. If anyone has issues, please let me know through the contact form. 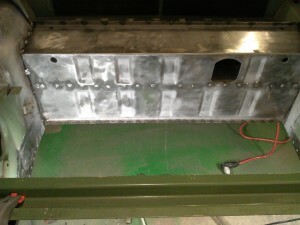 Before installing the donor axle tunnel backside, I chipped out excess undercoating over-spray and sand blasted the interior with my portable sand blaster. I don’t think this area was undercoated or painted at the factory. There only appeared to be some accidental over-spray and paint spatter in there, although there was some kind of primer-like coating of such poor adhesion that it practically wiped off. 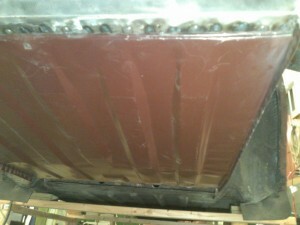 I left some of the solid undercoating there because it doesn’t show and it does no harm. The donor axle tunnel backside needed minor trimming and repair because of mis-directed cuts when I removed it. 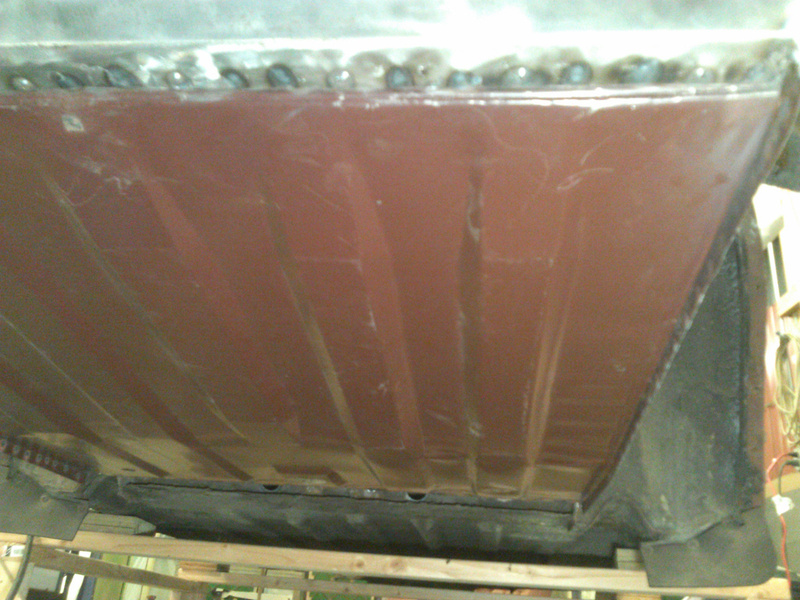 The finished backside is shown here, looking pretty good. Because the interior of the axle tunnel is nearly inaccessible, I figured this would be a good time to apply a protective coating to whatever wouldn’t be accessible later. 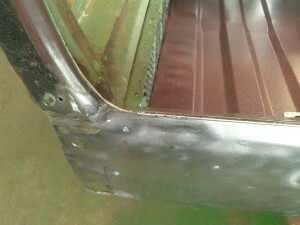 I used Rust-Oleum Professional High Performance Enamel spray for this. 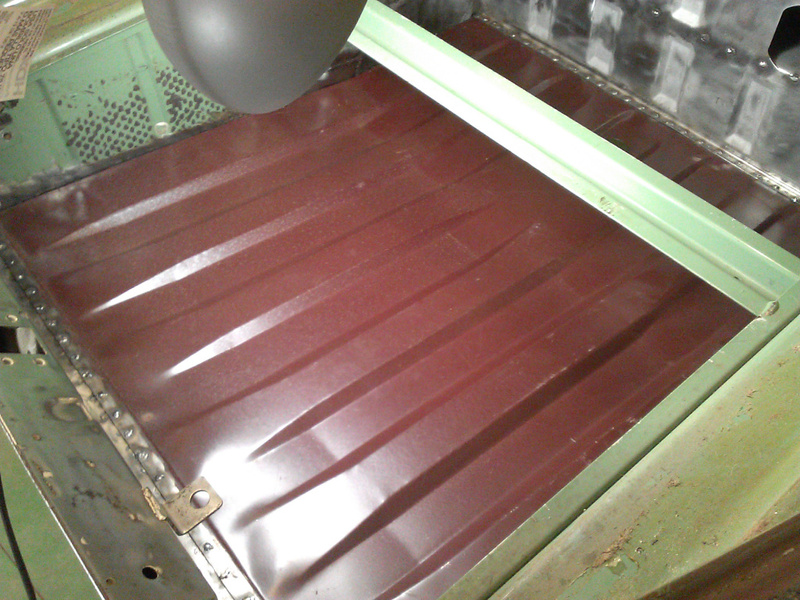 I know it’s not an automotive paint, but this is a hidden area and I just wanted an easy to apply, but effective, paint. I used this paint (gloss white) on our home’s doors, and it appears to be very durable, and sprays on well for a rattle-can paint. 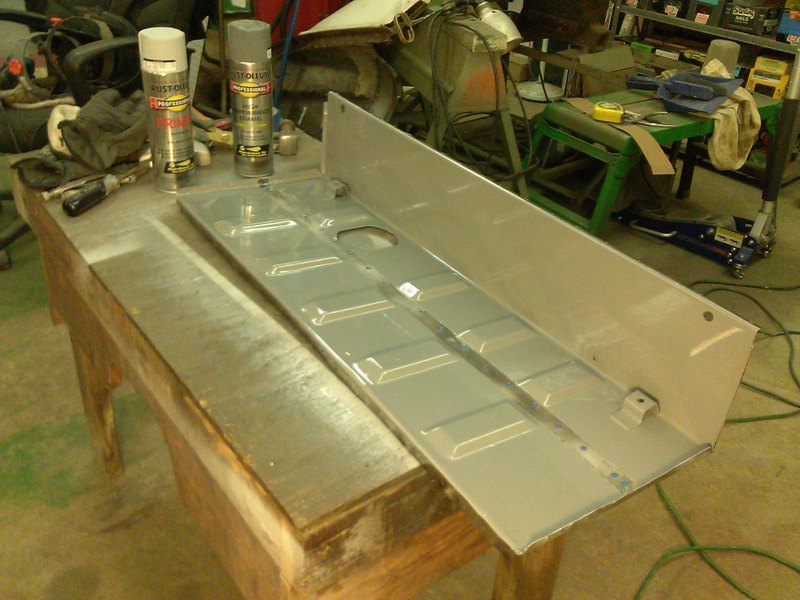 I primed with Flat Gray Primer and top coated with Dark Machine Gray after masking areas where welding would be done. I plug welded along the top of the axle tunnel backside using the holes created when I drilled out the original spot welds. 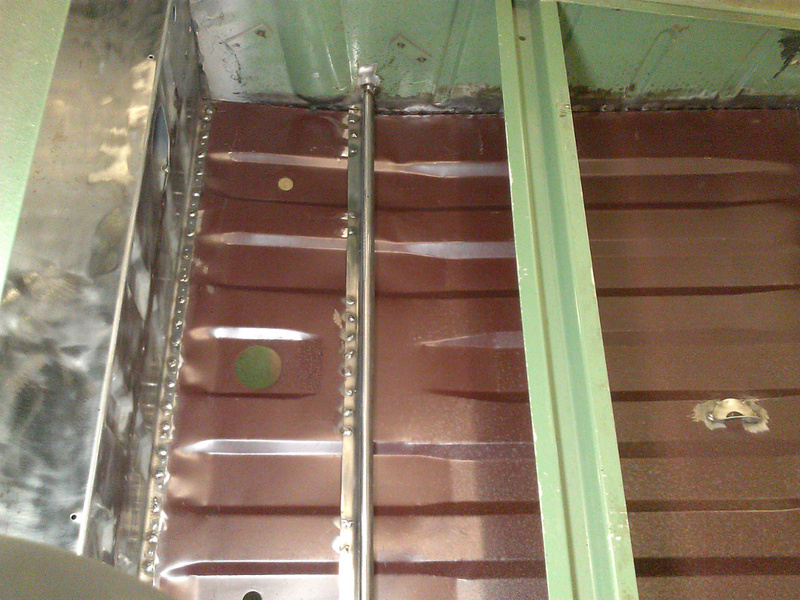 The photo to the right shows that welding setup. 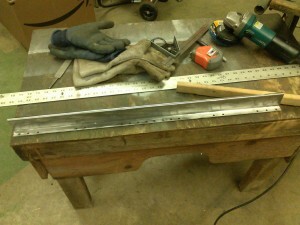 The following photo shows the backside midsection being welded using a very long Vise-grip style C-clamp. Welding Backside of Axle Tunnel Using Very Long Vise-grip Style Clamp. The finished axle tunnel is shown here. 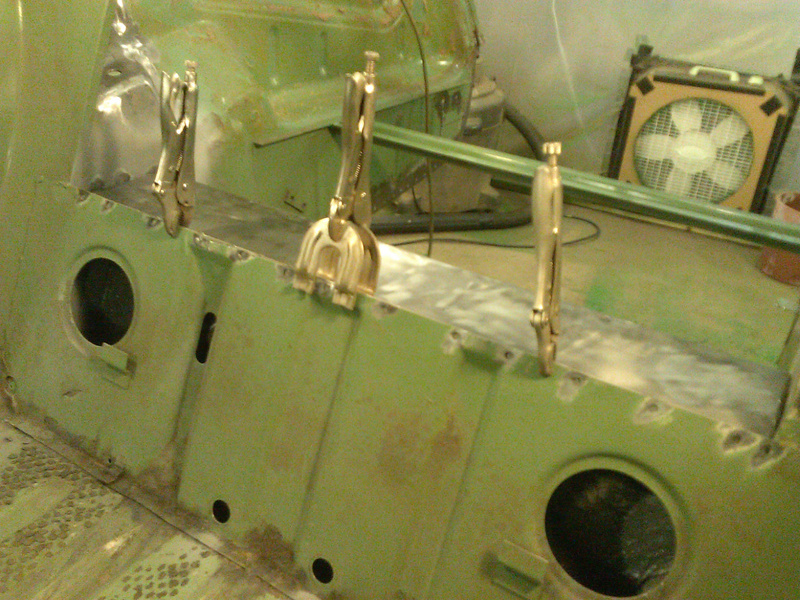 Besides the plug welds, I replicated the original, short tack welds along the ends where it meets the fender wells. It was now time to install the back panel after trimming, filling holes drilled during removal, and cleaning. The only issue was how to align it correctly to the body. 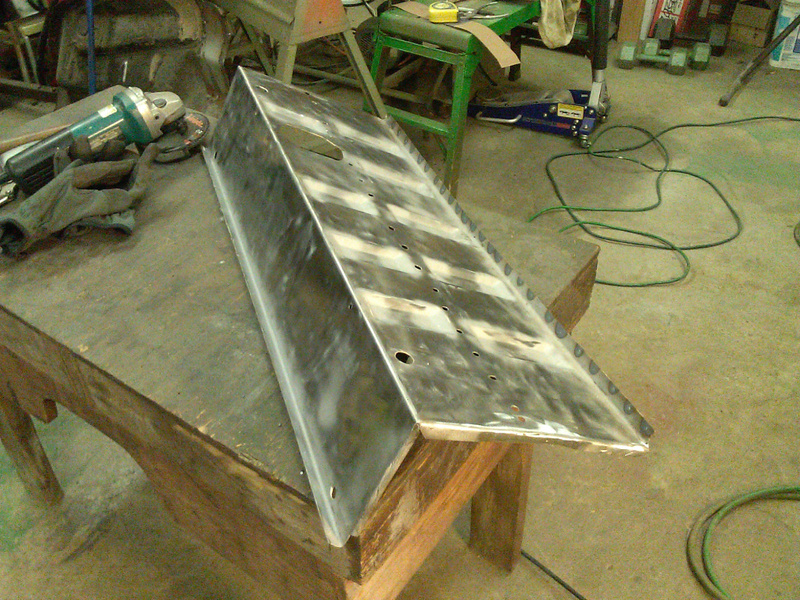 I figured the surest way to get it right would be to temporarily remount the fenders, and then mount the back panel to the fenders, with the welting in place. 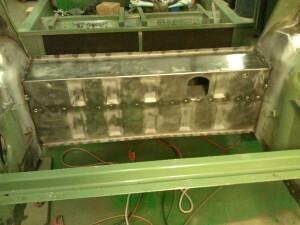 The photo shows the back panel ready for welding. 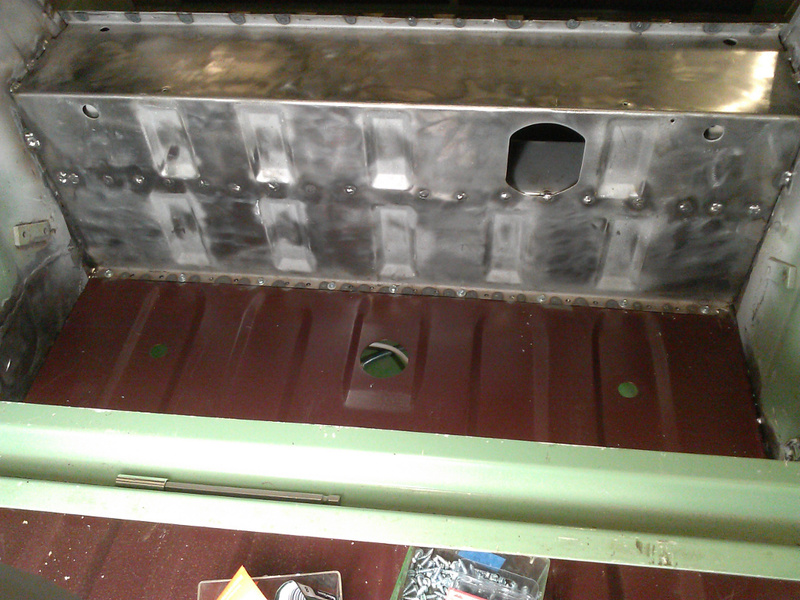 After tack welding the back panel, I figured I had better check squareness and fit. For this, I temporarily remounted the trunk lid. The trunk lid still had the original rubber weather strip in place, and the weather strip had a permanent groove formed from years of use. 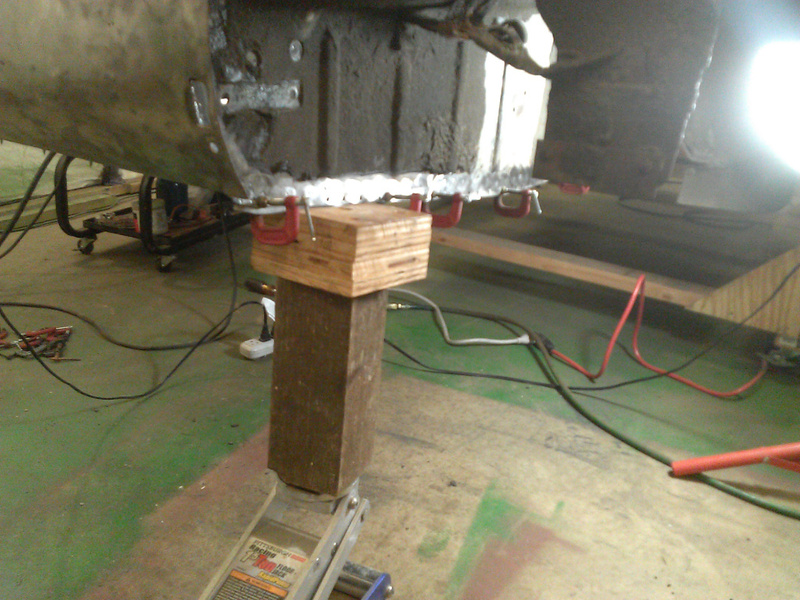 Sitting under the car, I could see that this groove dropped perfectly in place on both fender wells, and fit perfectly onto the donor back panel. I could not have been more happy at this point because I was paranoid about the possibility of weld distortion upsetting alignment. 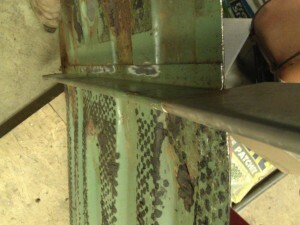 I painstakingly finished the welding — weld a spot, 1/2 to 1 second, blast with air to cool the area, and repeat many, many times. 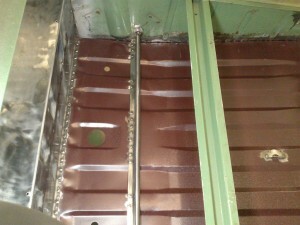 This procedure supposedly minimizes weld distortion. 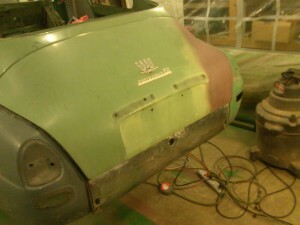 And, apparently it works because the trunk lid fit remained perfect. Before installing the new floor pan, a little prep work was necessary. First, I removed paint from any section of the pan where welding would take place. And then, I punched holes for plug welding along the back edge which lays down on the back panel lower lip. On the lower lip of the axle tunnel backside, I punched holes there, because the floor pan fits underneath that lip and I didn’t want to weld from underneath. 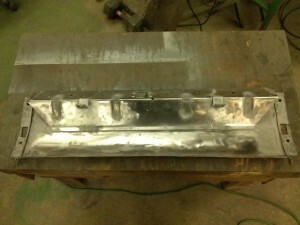 Both front and rear had 26 welds, at about 1-3/16″ intervals. I used my Onyx 605ST flanger/punch for this — one of my favorite tools now. 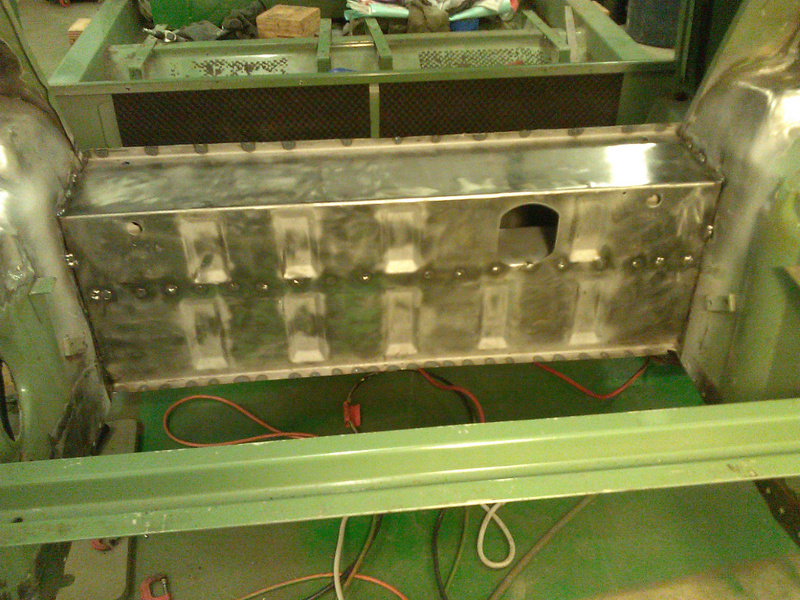 On the lower edge of the wheel wells, I planned on plug welding using the holes from drilling the spot welds. The driver’s side was okay, but whoever welded the original floor in place must have been sipping a little too much akvavit that day. He/she had the midsection of the floor pushed almost a full inch too high. 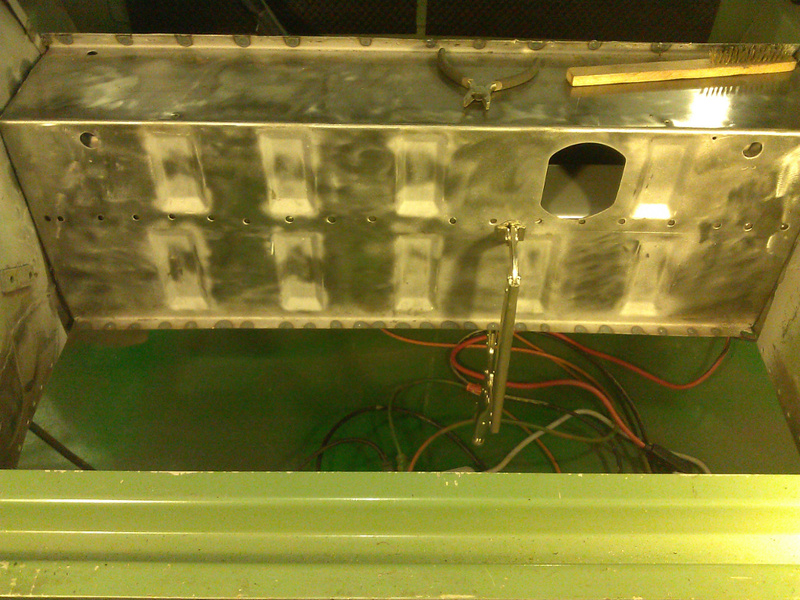 So I welded up those holes and punched new holes. 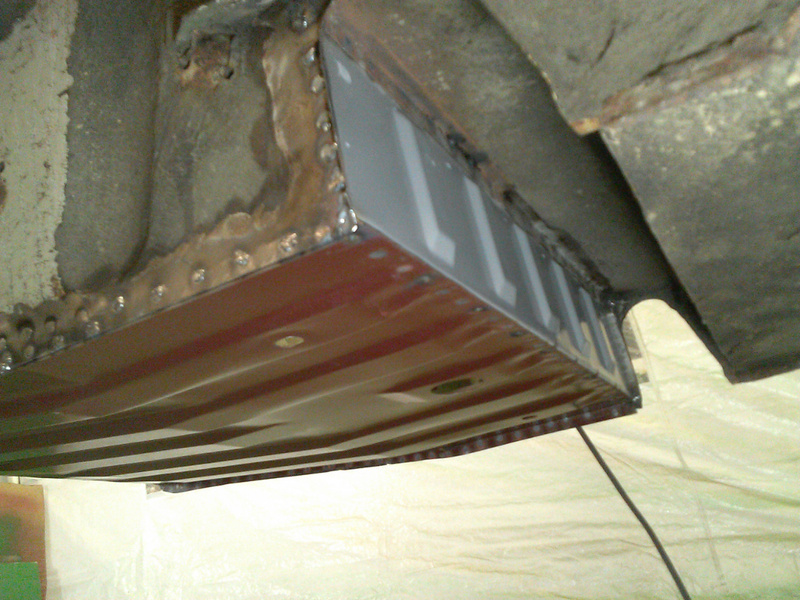 After setting the back of the floor pan onto the back panel lip, the front was temporarily held with vise grips while I drilled and screwed the panel first to the back panel, and then to the axle tunnel lip. I used just enough screws to hold the panel tight for welding. 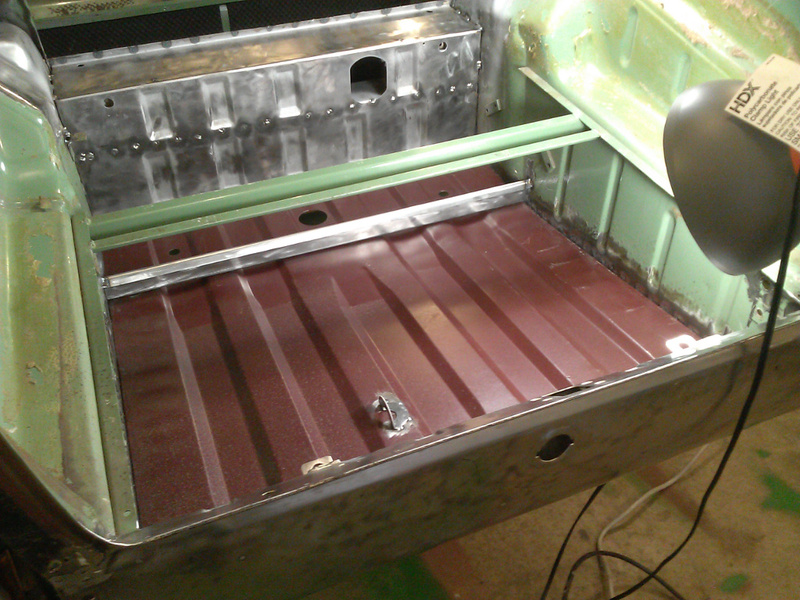 Before welding the front and rear of the floor panel, I aligned the bottom edges of the floor pan with the bottom of the wheel wells. 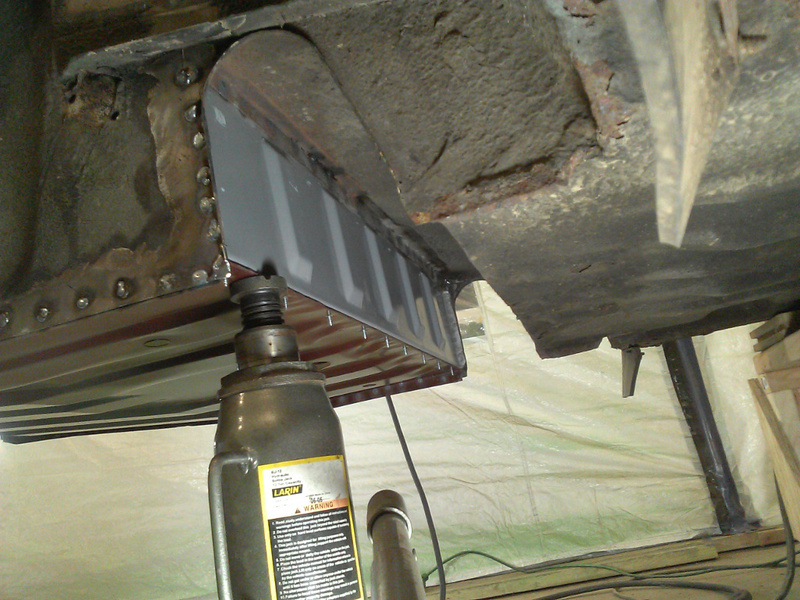 I then welded the sides of the floor pan to the wheel wells, using a welding clamp for a tight fit. It was now time to weld the front and back of the floor panel. 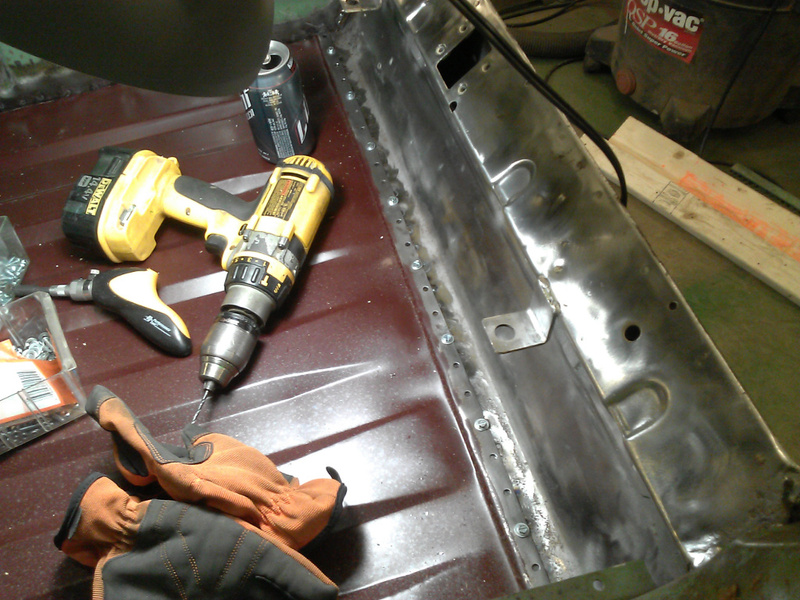 The screws held the panel tight, but to ensure the front lip was tight, I supported underneath with a jack under each plug weld. The result was a nice tight fit. 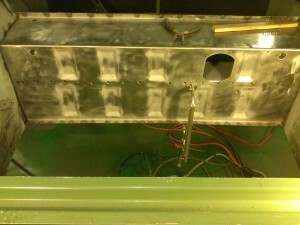 The second photo shows the completed plug welds, and the rest of the photos show various views. 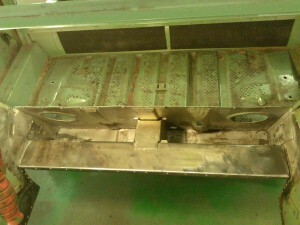 The last photo shows how well the back panel aligned with the wheel wells. 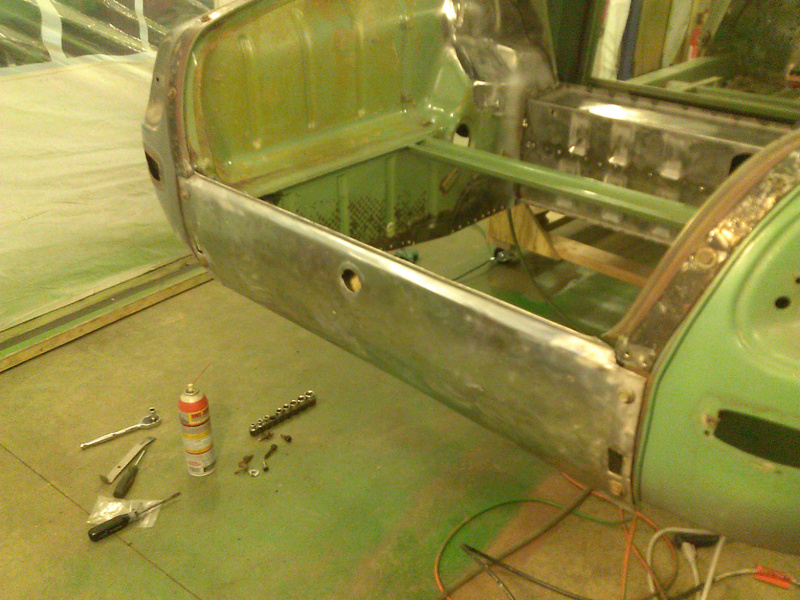 All that was left was to install a gas tank bracket and the spare wheel bracket. 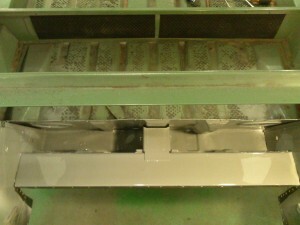 Because neither the donor nor the original brackets were in good shape, I decided to make my own. 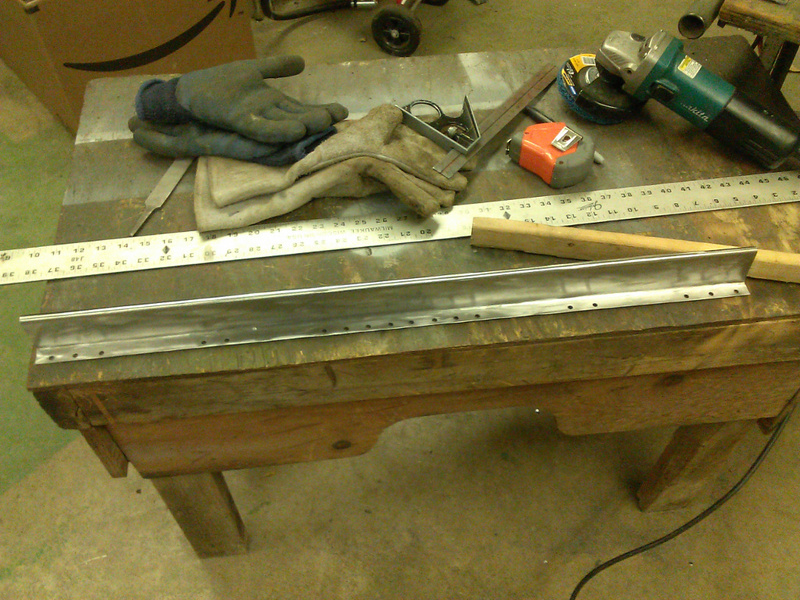 I cut a strip of 18 ga sheet steel to the correct width and set about forming the curved top lip. I thought I could form the curve with the brake press by bending a little, then advancing the sheet a little, and bending a little more. I was only partially successful. I only got it about half way when I could not bend it anymore. So, I used the brake press as a clamp, laid a 5/16″ round rod in place and finished the curve with a hammer and dinging spoon. 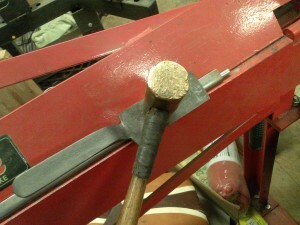 The dinging spoon from my Eastwood hammer and dolly kit prevented hammer marks and gave a nice straight finish. 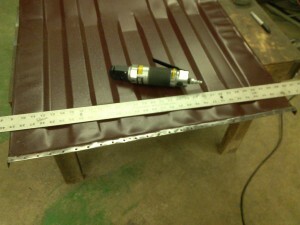 The curve contour came out nearly perfect as the second photo shows. This is fairly important because the gas tank straps won’t lock in correctly unless the contour is correct. 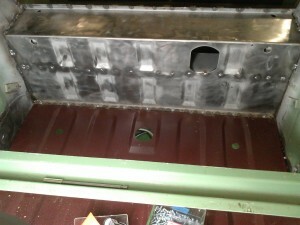 This photo shows the finished gas tank bracket, punched for plug welding. And, the second photo shows the gas tank bracket welded in place, along with the spare wheel bracket welded in place. And this is the nice solid naked heinie mentioned in the title of this post. Hi Edgar, I’m glad you’re watching. With 21 alpacas, 20 or so chickens, and a 160+ year old farm house, retired life is a lot harder than I expected. I’m going to put extra effort into the MC850 this summer, I hope. Thank you for continuing to post your progress! It is so nice to see what can be done using planning and skill, I am always impressed.